Flu Season is coming....Be prepared! Dr. Dixon Featured in Hampton Roads Physician Magazine. An internal medicine physician is a personal physician who provides long-term, comprehensive care in the office and the hospital, managing both common and complex illness of adolescents, adults, and the elderly. 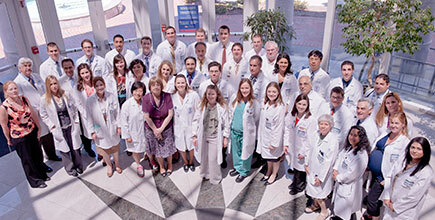 Internists are trained in the diagnosis and treatment of cancer, infections, and diseases affecting the heart, blood, kidneys, joints and digestive, respiratory and vascular systems. They are also trained in the essentials of primary care internal medicine which incorporates an understanding of disease prevention, wellness, substance abuse, mental health, and effective treatment of common problems of the eyes, ears, skin, nervous system, and reproductive organs. When you make an appointment to see one of our Internal Medicine physicians, you'll be walking into much more than a medical office: you'll be entering a Patient Centered Medical Home. The PCMH isn't a home in the traditional sense, but an innovative model of organizing and delivering care developed by the National Committee for Quality Assurance (NCQA). To become certified as a Patient Centered Medical Home, practices must complete a rigorous, comprehensive and transparent accreditation program. It is widely recognized as the most innovative program for improving primary care, and is the highest level of certification available today. Treatment is coordinated through Internal Medicine physician to ensure each patient receives the necessary care when and where it is needed. The PCMH is a centralized setting that facilitates partnerships between a patient and the internist - and when appropriate, with the patient's family. Care emphasizes interdisciplinary care provided by an entire team: from your physician to your nurse to your technician, even the front desk scheduler. Each member of the team has a role in managing your care. In a Patient Centered Medical Home, communication is key. We know that patients want more than a medical diagnosis and a prescription: you want the comprehensive, coordinated care that the Patient Centered Medical Home at EVMS can offer. Our team of physicians, residents and staff are here to care for all your health care needs. We offer a wide range of services and take pride in building positive, supportive relationships with out patients and their families.